In Living Realms minotaurs live in an honor based society where strength determines power in both the gladiatorial arenas and in daily life. There are two types of minotaurs; Obsidian Minotaur(deep minotaurs or deep oxen) and Pearl Minotaur(sea minotaurs or sea reavers). Obsidian minotaurs make their homes in the underdark, these minotaurs have clans who as a group build labyrinths to protect their homes from unwanted guests. As their name suggests they have black fur. There may be some color on their face usually a stripe of brown or grey and all have some shade of red in their eyes. Pearl minotaurs are at home on both land and sea, these minotaurs are ferocious sea raiders who rank as some of the most dangerous sailors in the world. They have claims on whole islands. The islands that are known are well guarded by dangerous reefs trying to find safe passage to their home is near impossible with conventional methods, the sea is their labyrinth. 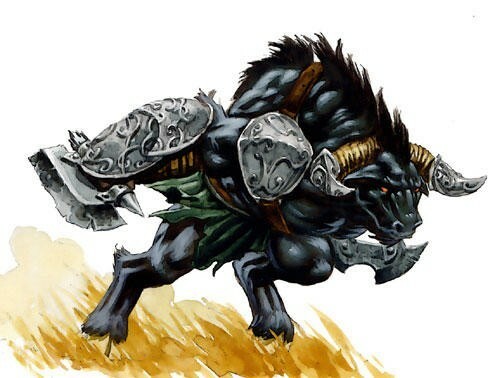 Pearl minotaurs aren't white but they are lighter in color than their obsidian cousins. Colors ranging from brown to grey the color on their face can be lighter some have been known to have a white stripe, though their eyes are still a shade of red. Minotaurs embrace the notion that the weak should perish and that the strong must rule and that they themselves are the strongest and most powerful race. They believe their destiny is to rule the world, and that their dominion will be one of conquest and military might. 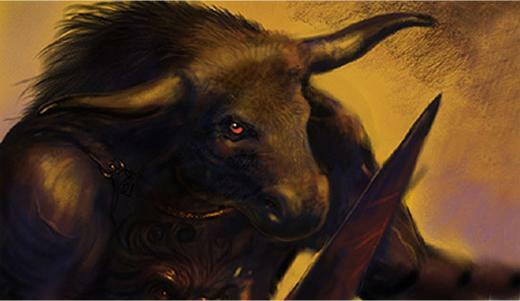 To that end, all minotaurs are trained in weapons, armor, and tactics from a young age. The minotaurs’ arrogance stems from a combination of strength, cunning, and intellect. Three virtues they hold dear, and which they deem the foundation of their greatness. They believe that this combination of traits is what sets them apart from their rivals. Minotaur society is built on the principle that might makes right, and that considerations of justice are unnecessary. Each race of minotaur is led by an emperor who is also served by a council of eight minotaurs. The obsidian minotaurs' is called the Supreme Circle while the pearl minotaurs' is called The Savvy Eight. All posts within the government, including the emperor’s, are won by the strongest and cleverest minotaurs, as proved by combat in the Pit. The Pit is the only means by which a minotaur can rise in society. It is a grand, annual display of single combat in which minotaurs battle each other for supremacy. Minotaur youths must prove themselves in the Pit to earn their passage to adulthood. Participation in the Pit is yet another reason why minotaurs look down on other folk. When there is a great dispute and neither party is willing to back down. Specially if a minotaurs honor is on the line, the final deciding factor is the Pit. To the minotaurs, death and glory in battle are a natural process. Combat is the key to ensuring that the strong survive, and that the weak are set aside before they can undermine their superiors’ grand schemes of conquest. 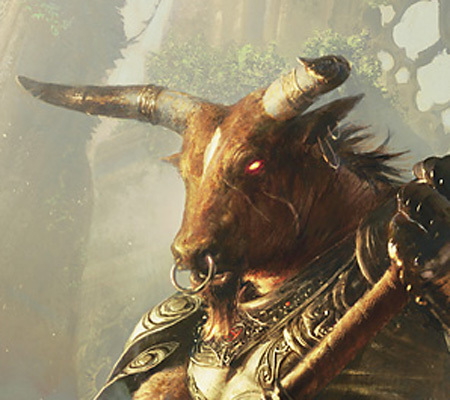 For all their cruelty, minotaurs are bound by a powerful sense of honor. Each victory brings greater honor to both individual minotaurs and their families. Defeat invokes a stain that only death can fully wash away. Honor demands that minotaurs keep their word once it is offered, and each minotaur remains faithful to friends and clan above all else. Minotaurs rarely befriend folk of other races, as they all too often encounter them only in battle. If a minotaur does strike up a friendship, it is typically with other creatures that display the minotaurs’ virtues and love of battle. To such friends, a minotaur becomes an ally whose support will never waver. Obsidian minotaurs lay claim to the underdark. Though, they only occupy several small parts of it. Their cities are surrounded by large labyrinths that can extend for miles. Wandering monsters have been known to make parts of the labyrinth their home. The minotaurs don't mind it, with the beasts living in the labyrinth it adds an extra layer of security. Some of these monsters are treated as "pets". These minotaurs, in their own minds, are currently at war with all other subterranean races. They believe they will take the world over from the inside out. Even though the minotaur believe they are superior to everyone else, they know all too well not to underestimate the cunning of the weaker races. • Drow Deep minotaurs have a great distrust and hatred for the drow. Any race who is ruled by the female must be weak, using surprise tactics and guerrilla warfare, they have no honor. The weak are prone to using lies to manipulate others, drow are to be distrusted. • Duergar The minotaurs favorite enemy to fight. When they see a tiny dwarf become large in combat they laugh knowing they are still just a tiny dwarf pretending to be something they are not. They also have been known to turn invisible, a tactic known all too well by the weak. Pearl minotaurs rule multiple chains of islands. 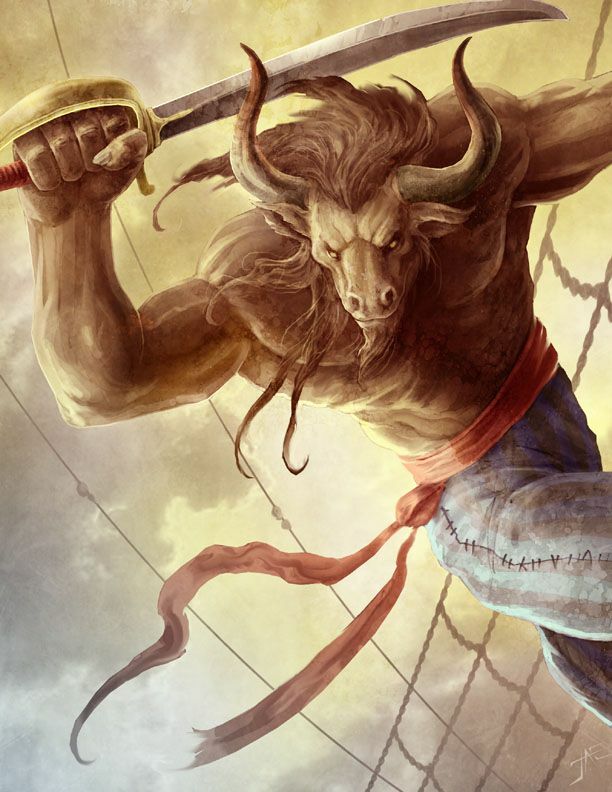 They are usually bound by the sea on all sides, the minotaurs focused their tenacity, strength, and cunning to become some of the most skilled and ferocious mariners in the world. They range across the water in their ships, raiding and pillaging as they wish. Minotaurs sometimes engage in trade, but they much prefer to take what they want by force. After all, as the strongest of all folk, they deserve the treasures and goods that lesser creatures have gathered. handed and if the need arises they have the option to use it two-handed for more damage. Minotaur clan names originate with a great hero whose descendants take on that name as their own, doing their best to live up to the ideals of their ancestor. Obsidian clan names are always preceded by the prefix “es‐”. Pearl minotaurs use “de‐”. Your minotaur character possesses a number of traits that reflect the power and superiority of your kind. Conqueror’s Virtue. From a young age, you focused on one of the three virtues of strength, cunning, or intellect. Your choice of your Strength, Intelligence, or Wisdom score increases by 1. Alignment. Minotaurs believe in a strict code of honor, and thus tend toward law. They are loyal to the death and make implacable enemies, even as their brutal culture and disdain for weakness push them toward evil. Size. Minotaurs typically stand over 7 feet tall and weigh an average of 350 pounds. Your size is Medium. Horns. You are never unarmed. You are proficient with your horns, which are a melee weapon that deals 1d10 piercing damage. Your horns grant you advantage on all checks made to shove a creature, but not to avoid being shoved yourself. Goring Rush. When you use the Dash action during your turn, you can make a melee attack with your horns as a bonus action. Hammering Horns. When you use the Attack action during your turn to make a melee attack, you can attempt to shove a creature with your horns as a bonus action. You cannot use this shove attempt to knock a creature prone. Labyrinthine Recall. You can perfectly recall any path you have traveled. Pit Weapon Training. You have proficiency with the Falchion and Heavy Crossbow. Sea Reaver. You gain proficiency with navigator’s tools and vehicles (water). Darkvision. You have superior vision in dark and dim conditions. You can see in dim light within 60 feet of you as if it were bright light, and in darkness as if it were dim light. You can't discern color in darkness, only shades of gray. Pit Weapon Training. You have proficiency with the Greataxe, Greatsword, Maul and Heavy Crossbow. Darkvision. Accustomed to life underground, you have superior vision in dark and dim conditions. You can see in dim light within 120 feet of you as if it were bright light, and in darkness as if it were dim light. You can't discern color in darkness, only shades of gray. Languages. You can speak, read, and write Undercommon. When creating a minotaur character, you can use the following table of bonds to help flesh out your character. Use this table in addition to or in place of your background’s bond or a bond of your creation. 1 My opponent in the Pit for my trial of adulthood was chosen years ago. Though we sparred only once, I fell deeply in love. Rather than fight my beloved to the death, I fled from home and have been branded a coward. 2 I’m the last of my clan. If I die without achieving great deeds, the hero who is my clan’s patron will be forgotten. 3 I was part of a raiding party that was defeated and enslaved. I’ve escaped and sworn revenge. 4 I never shared my people’s love of violence. I’m part of a conspiracy to topple the emperor’s violent regime. 5 I claim that I am an exile from my people, but in truth I have been sent to serve as a spy. I’m expected to leave secret messages telling my folk of villages and towns that are ripe targets for conquest. 6 I’m the last survivor of a ship wrecked in a storm. Occasionally, the spirits of my shipmates appear in my dreams and ask me to complete tasks they left unfinished in life.